▷ Blaupunkt TravelPilot 73 EU LMU update. Speedcam for your maps. Download update. Free custom download. In order to update your GPS device: Blaupunkt TravelPilot 73 EU LMU with the latest update, follow next instructions. First of all, be sure you got the update file for your Blaupunkt TravelPilot 73 EU LMU device, downloaded from SpeedcamUpdates.com. Connect your Blaupunkt TravelPilot 73 EU LMU gps device to the computer. Turn on your Blaupunkt TravelPilot 73 EU LMU gps device. It appears as a flash drive into your computer. Go to directory ".../content/speedcam" and delete all files into the speedcam directory. 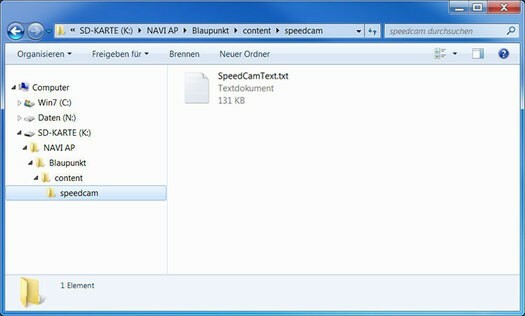 Copy and paste the file SpeedCamText.txt into the speedcam directory. Disconnect your Blaupunkt TravelPilot 73 EU LMU gps device from the computer. Reboot your Blaupunkt TravelPilot 73 EU LMU gps device (use RESET key). Run the the navigation software. The information about speed cameras will be loaded into your Blaupunkt TravelPilot 73 EU LMU gps device. Go outside with your Blaupunkt TravelPilot 73 EU LMU gps device. Turn on your Blaupunkt TravelPilot 73 EU LMU gps device and get GPS signal. Now you will be able to activate the speed camera alerts.